The Han conquest of Qin China had to wait until the great Qin emperor himself was dead and it still took a year of fighting to destroy the Qin armies. Then the victors spent four more years and a civil war deciding that the Han would command the succeeding dynasty and reunite the fractured state. 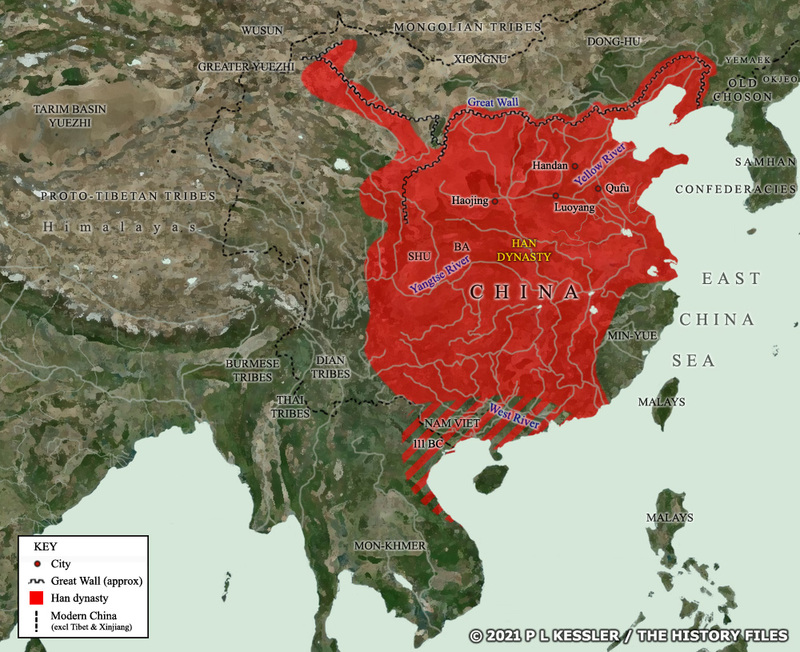 Following that the Han gradually expanded into neighbouring territories, especially in the south where they took territory from the Dian and conquered the kingdom of Nam Viet which, at the time, included territory that forms part of modern China. Some attempt was also made to subdue the nomadic tribes to the north and west, ultimately not very successfully. To select a kingdom, state, or tribe for further information, click on its name.